My kids HATE beets....you know...the pickled kind you get out of the can. So I haven't served them for years, until last night. On Monday, after taking my inlaws to the airport, I ended up having to detour, in the snow, to Grand Ave. in St. Paul to the Whole Foods store there (to which I'd never been, so I got lost, because I can't see, because I had lasiks last week which went very well by the way...) in order to get specially ordered SALSIFY, a tropical root nobody's ever heard of, (which oddly said "imported from Holland"??? on the sticker), in order for Andrew to earn 5 extra credit points (which is what extra credit always ends up being....ME driving and buying something) in Home Ec., (now called FCS or something I can never remember what it stands for) because he's been a goof-off and now needs to bring his grade up! ANYWAY, (this is my life), Lily and I braved the snow and ended up in the most WONDERFUL place! The vegetables at this Whole Food Store were incredible, and the most amazing of all to the eye, were these HUGE, BRILLIANT beets! Some were the regular, but still spectacular, purple, and some were a gorgeous orange. They caught both of our eyes at the same time, and after making Lily PROMISE she would eat them if I bought them, into our cart they went....she also stuck me for a new pair of wool knitted mittens. Unfortunately, the meat didn't get done in time, so Tim (who by the way brought me home roses) and Timmy had to leave without supper to go to basketball practice (Tim's his coach), and right as I was about to sit down and take my first bite of the much anticipated beets with the children that remained, the doorbell rang. The UPS man, who was supposed to come "after lunch" but instead was showing up at 5:45, took 25 minutes to figure out WHAT to charge me to return the ping pong table top (it sits on top of a pool table) that Sports Authority ASSURED us when we bought it that they would pay return shipping should we want to return it. Since we ended up getting a pool table off of Craig's List that already had one, we WERE INDEED returning it, but MYSTERIOUSLY, they couldn't ever seem to get the UPS RETURN TICKET to the right email address. It's called a RUNAROUND! They had NO trouble getting the VISA number right the first time when it was getting paid for!!! Anyway, it took the UPS man three phone calls and twenty minutes to decide to charge me $145!!!! (Tim was unavailable by cell phone, so I just paid it) Otherwise Sports Authority was going to tell us we were out of the 30 days return window. So by 6:10, the UPS man was walking away with my check, when I realized Katie had to leave RIGHT THEN for her basketball practice (my turn to carpool.) So off we flew! I walked back into the kitchen at 6:35, to dishes and cold food, and never did get to eat with my husband (who wasn't too pleased when I told him the UPS charge) or the kids. But I did eat! A lot! Of beets. No, they hadn't devoured them ALL, but they had eaten a good share and liked them, so it was a success! 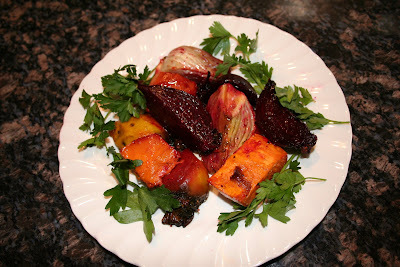 The roasting and seasoning brought out a wonderful "earthy" flavor, and they tasted much milder in "beet flavor" than the pickled ones. They were really just kind of sweet and roasty, and very pretty. In fact there was only one child who wouldn't even try the beets...you guessed it....Lily. Never count on the word of a three year old! So that's the story of the beets, along with a generous helping of our life! Suzanne, I love your story telling. And what a story it was. The beet recipe sounds great. I have really been into roasting vegetables lately. Don't know why I ever cooked them in the microwave before. (And home economics is now called Family and Consumer Science(FACS). You know that makes it politically correct. Thanks for the compliment and information! Family and Consumer Science... it just sounds so weird to me. Roasting veggies is my preferred method anymore too! So much flavor! Have you ever tried any other kind of oils? I want to, but I don't know what would be good. Sounds like a crazy night at the Lindquists! I didn't know UPS could charge so much for taking something like that back. Yikes. I think I would have sided with Lily though...there is something about the word beets that still makes me kring. The weird thing is that I don't even know if I have even ever tried them. Suzanne I was gogn to tell you FCS means but looks like someone else already did.